Fish Canyon is open, and the waterfalls are flowing. I want to write that first line in all BOLD CAPS. Because that hasn’t been said in 30 years. 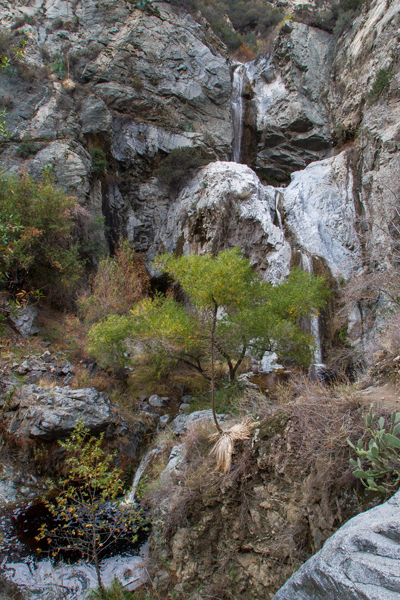 Fish Canyon, in the San Gabriel Mountains above Azusa and Duarte, used to be humming with people. Cabins were scattered along the trail and hikers posed next to the stunning triple waterfalls. 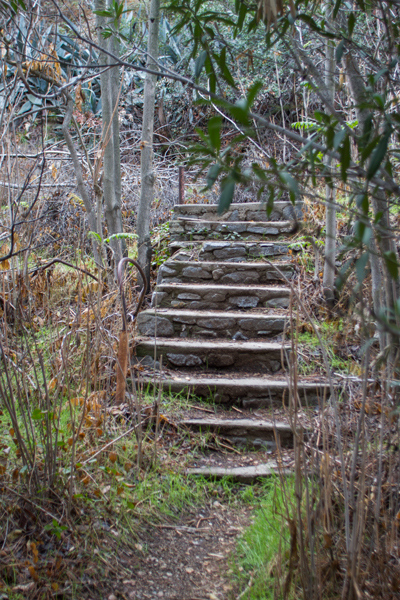 Steps leading up to the once cabins in Fish Canyon. But the cabins were destroyed in one of the many fires that flash along the mountains, and then the mining company who owns the canyon, closed the entrance to the public. But in a deal with the city of Duarte, in June of 2014 the Vulcan Materials Company opened access to the valley for the first time since it was closed in the mid-1980’s. I went on this hike in June when it first opened, and it was hot and dry, the only water standing lonely in sad dirty little pools. At the peak of the hike, where the waterfall should be, was just a towering cliff face standing bleak and empty of water in the summer sun. But now the rains have come and the valley has come alive with the sounds and sights of tumbling, churning, splashing and falling water. In the summer, when everything was hot and dry, this canyon did not feel so special, but now with the falling water, it’s easy to see why it was once a haven. It is a wonderful little river valley, with standing oaks, sticky cactus, a gurgling stream and the occasional birdcall. But the real treat is the waterfall. It falls in three sections. The first high up, its base invisible behind the jutting stone. The second falls thirty feet into a huge pool where the water laps at stones and there is a little spot next to the water perfect for a picnic. The third falls a further 10 feet tumbling down the valley. The water, just a day after the first rains in November of 2014, was a little brown, and below the waterfall there was foam as the crap from a dry summer washes away, but that should clear soon. 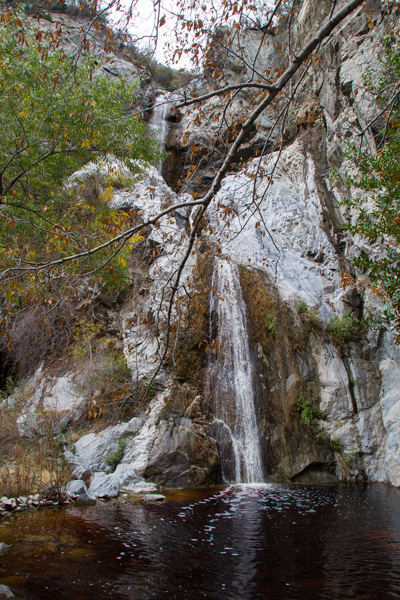 The triple waterfalls of Fish Canyon directly after the first rains of the season. The top and middle waterfalls of Fish Canyon, just after the first rain storm of the season, with the water brown with run off. 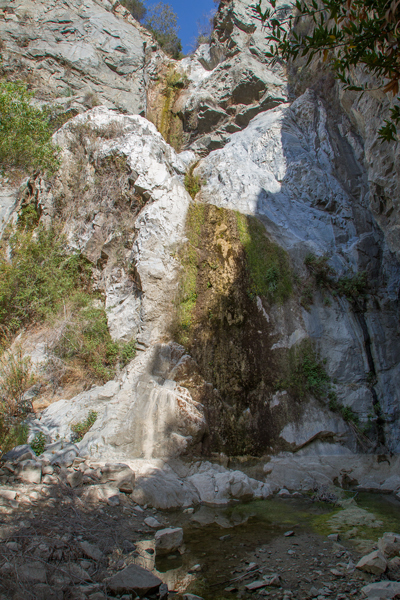 In June of 2014 the completely dry waterfall of Fish Canyon. The entrance to the hike is different from most. There is a fenced in gravel car park (closed at night) with a view up the valley. The view is of an industrial mining operation. Off to the right is a conveyor reaching into the sky spitting rocks onto a man made mountain. 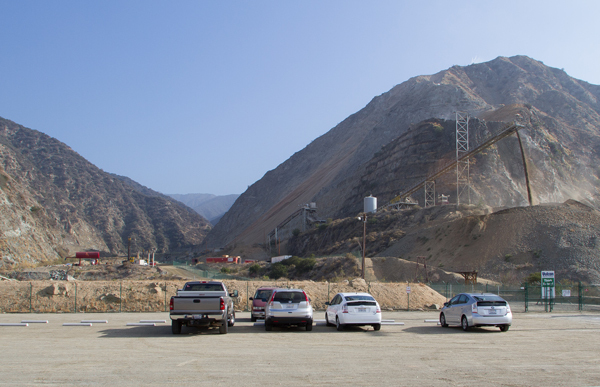 The newly opened parking lot at the base of Fish Canyon, which cuts through the mining operations to reach the canyon. To reach the car park, drive the 605 freeway all the way to its northern end, to make a right on Huntington Drive. If on the 210 freeway exit at Mt. Olive, which is right under the 605, and make the same right on Huntington. Once on Huntington, drive a short distance and make a left onto Encanto Parkway, at the end of this road, amid all the chain link fences, is the entrance to both the mine and the hike. The trail leads from the car park along a path flanked by chain link fences. It leads through the heart of the mining operation, even directly underneath one of the gravel moving conveyors. 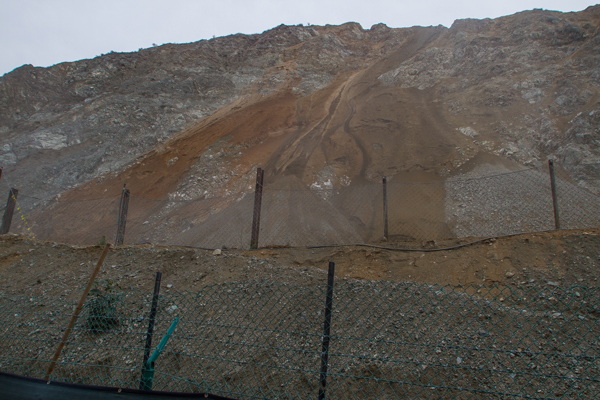 The company is mining the aggregate from the top of the mountains on either side of the valley. They are basically grinding the stone into gravel and this is used to make the roads we drive on, among other things. To get the rock from the top of the mountain to the bottom, they use the infinite resource of gravity. It is pushed off the mountaintop to create an avalanche down the cliff face. In June they were doing this on the western cliff face, and in December on the eastern cliff face. The tons of rock flowed and growled down the mountain in its own beautiful way. Every once in a while a boulder the size of a car engine bounded down the cliff face in huge thumping leaps. The power and noise of all that rock on the move is awesome. 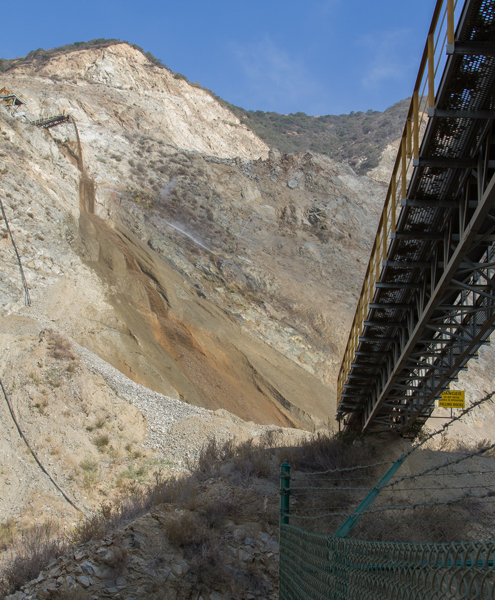 Aggregate is thrown down the side of the western mountain as mining operations are viewed from the newly created hiking trail up Fish Canyon. Gravel and rocks are pushed down the side of the eastern mountain next to the new trail up Fish Canyon. But after hiking 0.7 of a mile, where the trail crosses a small metal bridge, the hike changes completely. On one side is grit, and gray, and grumbling noises of machines and falling rock. On the other side is burbling stream, birdcall and the (somewhat) green of Southern California. 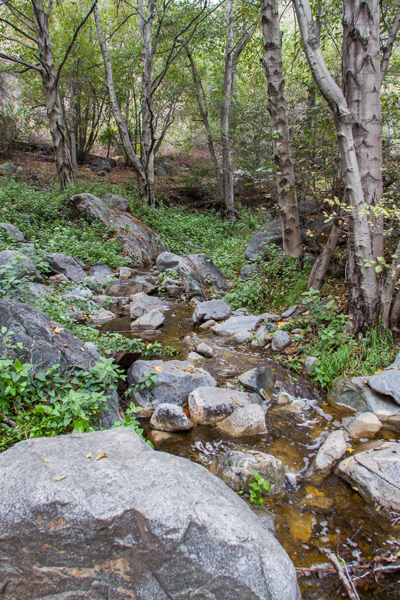 The water flowing after the first rains of the season in Fish Canyon. The trail, unlike most of its river valley neighbors, does not follow along the edge of the stream. It follows a thin path on the cliffs up above. The hike is no too difficult, mostly smooth and even, although at places it is beginning to wash away and cautious steps are need to avoid falling down to the hard rocks below. 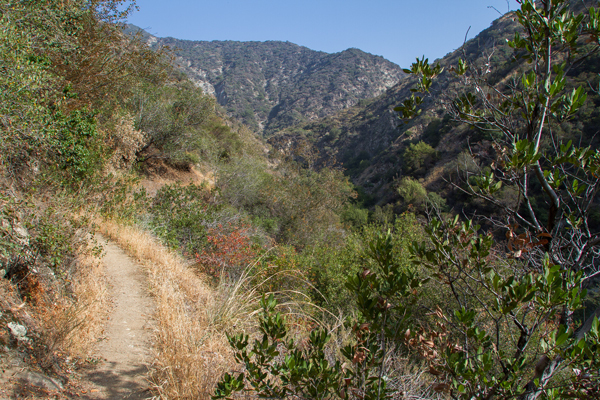 The trail up on the hillside of Fish Canyon in June of 2014. Most of the trail is along the western wall, which means morning sunlight and afternoon shadow. Recommendation: on a cool day, hike in the morning sun, on a hot day, hike in the afternoon shade. Details: The waterfall is 2.8 miles from the car park, so a round trip of 5.5 miles. The elevation begins at 680 ft. and the waterfall is at 1380 ft. This has quickly become one of my favorite hikes, it has an interesting juxtaposition, or should I say a reflection of what I love about Los Angeles and its mountains. Part of me loves the city, the noise, the concentration of people. Loves the industry, the concrete walls, the roads, the things that we humans have built. But another part of me loves to disappear into the quiet of the mountains, into the perfect white noise of birdsong, gentle tree blowing wind, and a cascading waterfall. I am happy to be able to hike Fish Canyon. 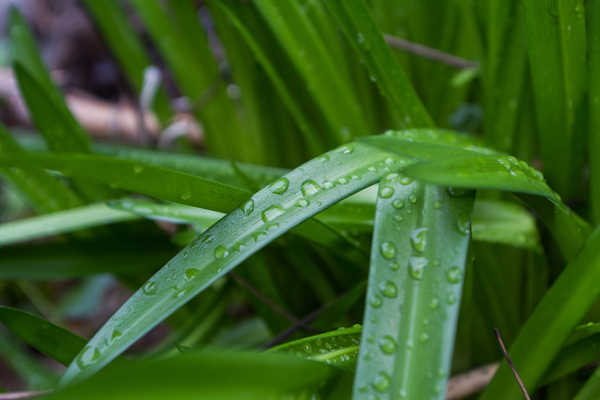 Remnants of the first rains of the season in Fish Canyon.